It took me all week to tat Jane's chicken wing pattern, very apt for this time of the year, when we think of chickens, eggs and Easter! The pattern can be found here. 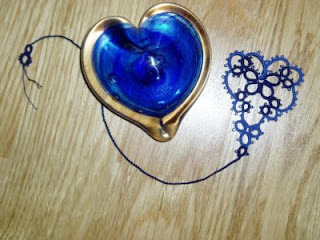 I used some thread Jane gave me last weekend and combined it with some thread I had at home. 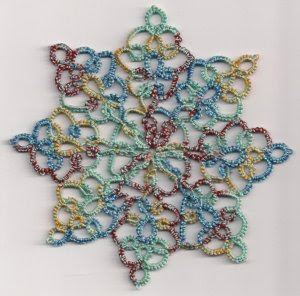 It is a lovely pattern and I fully intend to work it again, but the trials and tribulations were not caused by the pattern, time was the reason I was so slow at completing it. No the trials and tribulations are caused by the "Pop-A-bobbin Tatting Shuttle!" When the suggestion to I'm in the garage about the idea of making wooden shuttles was tentatively made last year, I never thought, nor did he, that it would be a project that would go quite the way it has! The first attempts to make a wooden shuttle in the Autumn didn’t go well and so it was back to the “drawing board” and eventually a shuttle has been produced that is proving to be acceptable to a lot of tatters. However, I thought it might be a good idea to publish a few posts on how all the different components and packaging have caused challenges, frustrations and problems since we started making these shuttles. So I've identified seven elements that go to make up the whole of the “Pop-a-bobbin tatting shuttle” each have a story behind them. Seven is a very biblical number, and occurs throughout the New Testament and Old Testament, but seven also reminds me of the film “The Magnificent Seven” But over the last few months there hasn’t been much magnificence when it has come to sourcing the different materials that we have needed! 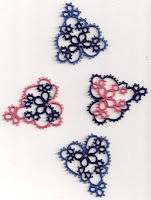 So here are the different elements that make up the whole of the "Pop-A-bobbin tatting shuttle" in no particular order. THE HOOK - which has caused quite a lot of conversation between tatters in the last few weeks. The first hooks that were made were literally just metal bent over and I said to “I’m in the garage” that they needed to be the shape of a hook. 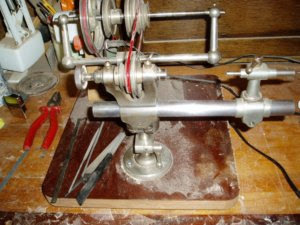 So he used his watch makers lathe (he repairs clocks). However, some people have found that they snag the thread, so he is now smoothing them off, or what he calls another “finishing process”. Our attempts to find ready made hooks have been exhausted for the time being so it seems that the handmade ones are going to be with us for a while. THE BOBBIN – on the original shuttle design we tried machine bobbins but found them to be bulky but worse still they were not flexible enough. So the only way was to use the Aero bobbins, however when we went to an English supplier and tried to purchase a few more than are normally required, we found that they were a little reluctant to let their stock go in one large order! Our next try was a supplier in America and for the first batch this was fine, they were very helpful and the consignment arrived in just over a week. Sadly though the next consignment posted took over three weeks and we had to pay customs duty on them which was quite a bit and made them very expensive. We have phoned manufacturers direct but they will only sell to their own suppliers and the suppliers will only sell to businesses and last week I was about to give up. However, Jane has spoken very nicely to a supplier and hopefully the problem will be resolved. The other fact we have found out is that there seems to be two different manufacturers making these bobbins so we have to be sure that the bobbin we supply with the shuttle is the correct one! 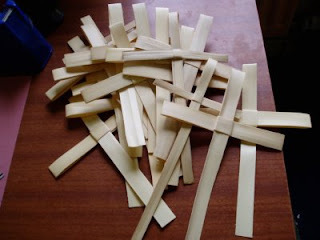 Today is also Palm Sunday and here are some of the palm crosses that were given out at church this morning. We are now entering Holy Week, so I guess the title to this post "Trials and Tribulations" are much more relevant to this coming week as we follow our Lord to the Cross. 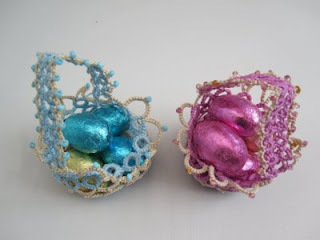 I know it is a little early for Easter but the shops are full of chocolate eggs so I thought I would show a few on my blog. The little baskets I tatted using Jane's pattern. The thread is ancient Coats but the colours seem to blend well together. 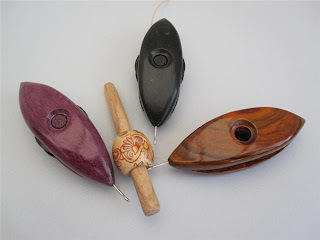 Now here are the latest pop-a-bobbin shuttles. 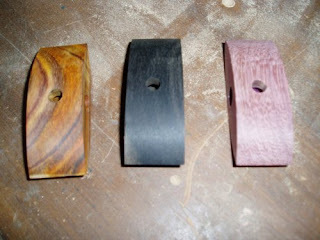 Purple heart, ebony and coco bola rosewood (which seems to have its plug missing!). Where did you put it Jane? The popper tool is also very attractive don't you think? The three of us "I'm in the garage", Jane and myself had a management meeting on Sunday, the first time we have all been together in one room since production had started. Anyway we sorted a few teething problems out, well at least tried to! There have also been a few supply problems which has caused a slight delay in sending orders out. I will tell you about them on another post as they have not yet been completely resolved. In fact today has been a most frustrating day chasing bobbins, and at one point I wanted to give up with the whole idea of these shuttles. Tomorrow might bring some good news. Life has been very hectic in this part of the world and so there has been very little time for tatting. 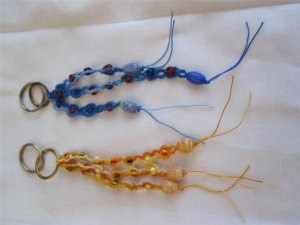 These are two key rings I made earlier this year. I'm not going to use them for carrying keys around on but rather for holding those keys that remain indoors such as spare keys or keys that are hardly ever used. So I will hang them up on a key ring holder in the hall way. Here are the latest shuttles lined up on a table. Some of them will be travelling on Saturday to Jane's home. Unfortunately due to the delay in the bobbins arriving not every one who has ordered a shuttle will receive them from this batch. As you know the hooks for the shuttles are hand made by "I'm in the garage", over the past three weeks we have been trying to source ready made small hooks at a reasonable price from various places which include India, Japan and China but so far we have been unsuccessful as the order for such hooks has to be in the region of thousands to make it viable for the manufacturer. If we could obtain these hooks it would cut down on the work involved in making them and hopefully satisfy the people who are not completely happy with the hand made ones. 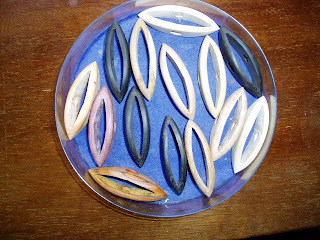 Unfortunately, it seems that the only way the hooks can be obtained, is by purchasing full size crochet hooks and then cutting them down to size, this is a very expensive and wasteful exercise. If we did this it would mean that the shuttles would be a lot more expensive. Also a part of me, is very loath to be so wasteful, especially in a world that throws so much away. But then perhaps someone knows how to re-cycle the remaining pieces from mutilated crochet hooks?! Tomorrow is Mothering Sunday and not Mother's Day which over the years it has come to be known as in the UK. Mothering Sunday has much earlier origins as a date in the Church calendar. It was a day when people returned to their “mother church” – the nearest large church or cathedral – on the fourth Sunday of Lent. As such, the date moves with the date of Easter, so can fall any time from the start of March to mid-April, which means if it was not for the commercialisation of the day few people would realise when it actually was! Despite its historical significance in the UK, it is now almost impossible to buy a card that says, “Happy Mothering Sunday”. Also on this day those who were in service, such as maids and living away from home, were given the day off and were allowed to visit their mothers, often bringing with them flowers that they had picked on the way. The pink one on the right is made with 20 thread and all the rest are made in 40 thread. In America Mother's Day is celebrated on the second Sunday in May and has nothing to do with Mothering Sunday. 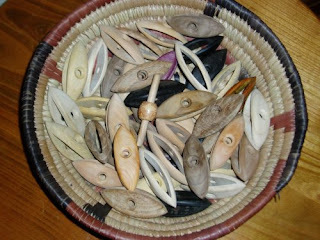 Now those who are waiting for their Pop-A-bobbin shuttle, just might see it in this basket! Don't they look fabulous? Its fascinating to see the the different coloured woods. I can also inform you that "I'm in the garage" has a new piece of equipment (boys and their toys!) and now is able to work the shuttles into a far better shape. The other week a few of us went on a fact finding trip to some churches looking at modern stained glass windows as we are going to have a new one put into an old church. This ancient font was outside a church and I just had to take a photograph of it. 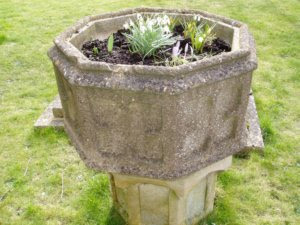 The font makes a very unusual flower pot and is just right for a celebration of Mothering Sunday and seeing the snowdrops peeping out is a reminder that Spring is on its way. As you all must know by now, unless you have been on another planet! The Pop-A-bobbin shuttles are in full production and there are quite a few different woods they are being made out of, which I will try and list soon. Some woods we have bought locally and others have been purchased from overseas. Sharren Morgan asked for a cedar shuttle when the last batch were being made, and so far she is the only person to own one made out of this particular wood. 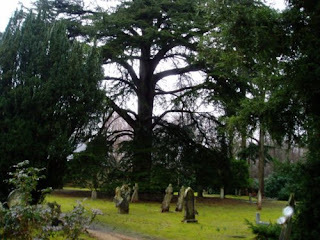 The cedar tree that the wood came from is in these two pictures. As you can see it is very near to the church. 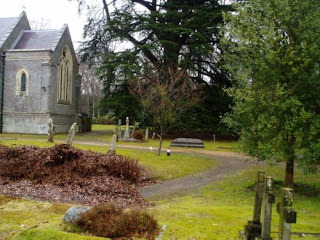 About 18 months ago the tree had to have a huge branch cut off it because it was dangerously close to falling on the church and doing considerable damage, particularly as there is stained glass window that would have been badly damaged if it had fallen. One log of the wood was brought around by the Vicar for "i'm in the garage" this was before the shuttles were a glint in his eyes! Now this particular tree is beside a church that used to have a Vicar who was very fond of trains, his son was born in this area and spent his early years here, he also took up his father's love of trains and became a clergyman himself. His name was Rev Awdry and he wrote the now very famous Thomas the Tank engine stories. So he would have indeed seen the tree and probably ran around it as a child. You might have noticed a few rain drops on the pictures of the church, I took them last Sunday, it was raining, very cold and I almost fell over a tombstone! 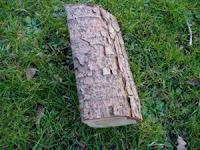 Here is a piece of the original log that was given to us. 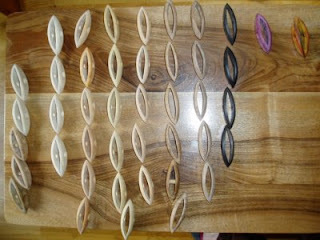 And just to show you that the shuttles are progressing here are a few, I'm sure you can identify the ebony, purple heart and cocobola rosewood. I have a shuttle that was made out of the old timber from the porch of another church, shown in this post, it is oak. There are a few more shuttles that can be made from this wood if anyone is interested? I have also brought home some yew wood taken from the tree outside this church and it is now seasoning. The stories behind some of the woods that are being used for these shuttles, are fascinating and makes them very special. I think seahorses are fascinating especially the way they glide through the water, mystic beautiful creatures. But did you know they are the only species in which males truly become pregnant? Well there is an amazing fact! How many times have you heard it said "if men could have babies the world's population would decline?" These two are now on their journey to Canada, not swimming but in an envelope with an airmail sticker. 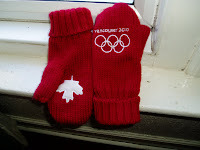 They are being sent as a way of a thank you to two people who I met from Canada in January. Robin and her daughter Hayley. They both helped find and then order for me an adult beaver costume, which arrived so quickly, it was ordered on a Monday and the parcel arrived on the Thursday! Which could be faster than a tatting shuttle!? Hayley is very fond of sea horses hence the reason why I am sending them. Also in the envelope is of course a tatted Robin for Robin! 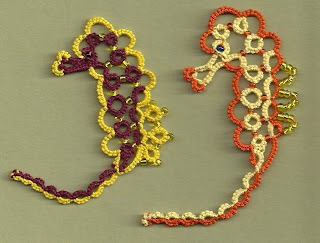 The pattern for these dear little seahorses is here on Jane's pattern page. 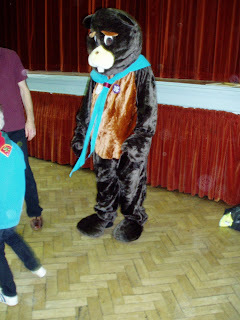 This is the beaver costume, the one I was carrying the other week, mentioned in this post, and no its not me inside it - I promise! Bertie was invested as a Beaver Scout on Saturday, as you can see he has his own neckerchief and woggle. Beaver Scouts are the youngest members of the Scout organisation they start at six then on reaching the age of eight they can join the Cubs. We had a party on Saturday and 125 Beaver Scouts attended. The noise level was rather high with this amount of excited children and so yesterday it was good to be in a quiet church instead of trying to raise my voice above so many children. I took a picture of the three different woods now being worked on by "im in the garage" coco bola rosewood, ebony and purple heart. They are actually a bit further on in the shuttle making process but I just had to take this photograph to show you how lovely the wood is. Are you drooling over them? Can you imagine holding them in your hands?! I must admit I didn't watch any of the Winter Olympics, except for the highlights on the news. So now that they are ended, all of you who have been focused on them will have more time to tat, but then again you must be able to tat and watch television? And finally Happy St. David's Day to all thoses in Wales.